Not surprisingly, Robinson started things off quickly with fast ascents of the V13s Anti-Hero and Loved By Few, Hated By Many. 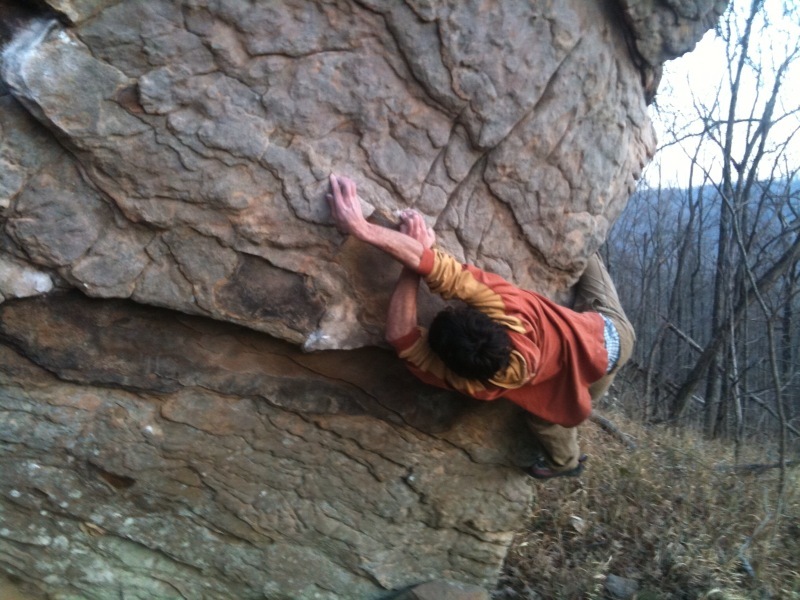 The same day he also flashed Bloody Knuckles (V11) and nearly sent Daniel Woods’ Welcome To The Fight Club (V13). For good measure he threw in an ascent of Typhoon, a problem given V11 by all other 8a.nu registrants, Hurricane (V10) in his street shoes. The next day, Robinson turned his attention to Dave Graham’s V14 Wood Grain Grippin’. Seen briefly in the Arkansas dose in Dosage V, WGG had only been repeated thus far by Daniel Woods. Wasting little time, Paul sent in a handful of attempts for an impressive 1 day ascent. Moving on to Fred’s Cave outside of Cowell, AR, Robinson quickly dispatched nearly all the problems in the cave. He did V12s One Inch Pinch and Chunk Up The Deuce in a few tries, flashed Fred’s Roof (V11) and did Buddy (V10) second try. Making the short move to the nearby unrepeated Dave Graham V14 Lost In The Hood, Robinson put in a few tries working on the “lurpy” deadpoint crux as well as the top section. Sounds promising if conditions hold up. Robinson has a couple of weeks left in Arkansas to try and finish a couple of hard sounding projects, one being a 30 move roof with a crux near the end, before moving on to Southern Utah. As always, I will provide updates as events warrant. Hard Very difficult, sort of like a one percent move but not really, one long hard deadpoint, longfellow and oddfellow. definitely height dependent. Could be harder. Pretty. Soft quick. 6 or 7 tries. A couple tries last year. 2nd ascent Excellent! Soft soft 8b… dont think it should get the full downgrade though… i dunno. 3rd asc. one real hard move! Here we have 3 very capable climbers (2 with loads of V13s and V14s under their belts) with 3 differing opinions about what is basically a 1 move boulder problem. It’s obviously splitting hairs to pick a specific grade given how much of a role conditions and body size play in sending problems like LBF,HBM, but I always find it interesting to read first hand opinions on what these problems are like. To me it emphasizes the fact that while it is interesting to report specific numbers when reporting news like this it is really impossible to say definitively what problems will be graded years down the road after more people have the chance to climb them. Paul’s street shoe ascent was actually of the stand start to Typhoon, Hurricane V10. We had the names backwards when we were showing him around and didn’t realize it until he had updated his 8a. It was crazy though. Thanks, I’ll make the correction. Was the footage of Ty climbing WGG in Dosage V NOT from the start? As far as I know Ty hasn’t done it so I’m not sure what the footage was supposed to be showing. What double digit FAs in Arkansas has Paul done? That was a poor way of phrasing it on my part. It was meant to have more of an anticipatory tone. The crux of WGG is the first Couple moves. The mount holds are miniscule and bad. The footage of Ty shows him doing just the back half of the problem so I assume that he just never could do the crux. All the stars come to arkansas to boulder, but just stay in the same 2 or 3 areas, ticking up repeats or doing variations for FA’s. There’s so much untapped potential in the woods of the Ozarks, literally crags and boulder fields that no one’s tapped, mainly because of logistical and access issues be it private property or the trailblazing that would be required. I’d like to see some new crags and boulder zones be opened up for some fresh FA’s instead of this same old stuff.